If you have a non-profit organization, charity event or any other environmental or social project and you’re searching for the perfect website template, then we’re here to help. Finding the ideal template for this kind of niches is very hard work because you must keep in mind a list of essential features, such as a clean and well-organized design, a fully responsive and modern layout, a Donation or any other call-to-action button and all the informational pages you will need! And because we want to help you find the perfect solution for you, we put together a list of 25 of our favorite non profit website templates that we’re sure will be perfect for countless organizations and good causes! Feel free to take a look and choose the perfect one for your ideas! Ecoisty Template is a great HTML template that will help you create stunning websites for various environmental projects or even businesses that sell green products. Ecoisty comes with a fully responsive and mobile-friendly layout based on the latest Bootstrap version. This awesome template lets you choose from 2 homepage designs, an eye-catching countdown and you can even add stunning parallax effects to your website in order to achieve the perfect results! If you’re looking for a great non-profit template that comes with both beautiful design and full functionality and flexibility, then SUNE is the way to go. This template is extremely easy to use and it has a very user-friendly design. 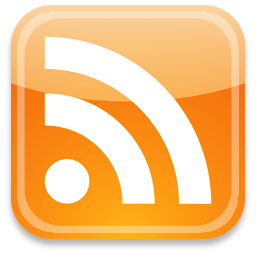 We strongly recommend it for personal ideas and even non-profit organizations and charity events. SUNE was designed and coded on the Bootstrap grid system and it allows you to personalize it using free Google fonts and lots of icons! This template has all the necessary pages you will need for your website! Next on our list is Believed, a very simple but effective HTML5 template designed and coded with non-profits in mind. This template comes with an amazing, fully responsive layout and lots of customization options that will help you achieve the ideal result for you and your ideas. Believed was created using HTML5, CSS3 and Bootstrap 3.3.7. It comes with more than 22 page templates and many other features and elements! 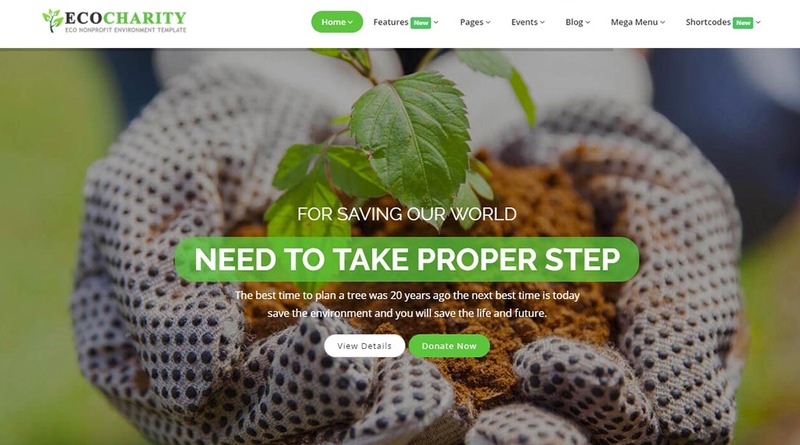 CharityPress is another great example of a clean but powerful website template created specifically for fundraising projects. This cool template comes with already-created elements that you can easily import and move around as you please. We strongly recommend this one for any NGO, donation, fundraising and even church! Because it has a fully responsive layout, you can rest assured that your website will always look and work perfectly! Malikop Template is a very modern and versatile website template based on the latest Bootstrap version. This cool template comes with 2 stylish homepage variations and a fully responsive and mobile-friendly design. Maikop follows the latest design trends and it comes with clean and well-organized HTML5 & CSS3 code. You can even add smooth transition effects to create a strong impact on your visitors! 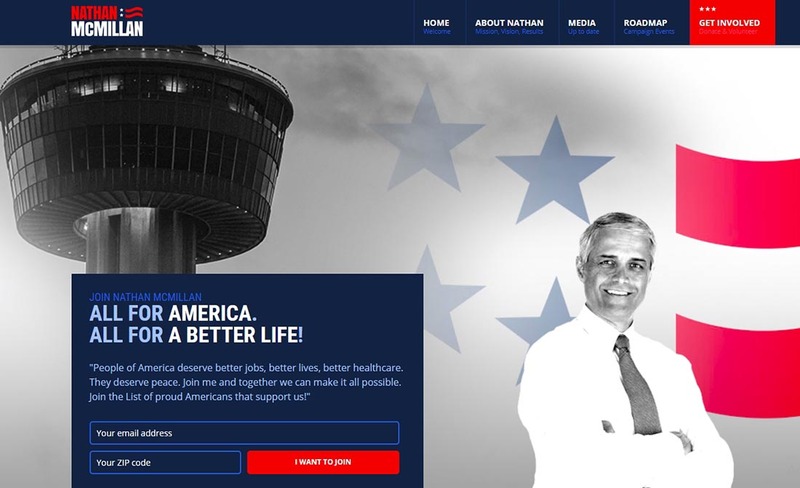 Here we have Electoral, another gorgeous HTML template created for political websites that can also work perfectly for any kind of non-profit website! This template has a very professional template and it comes with tons of elements that you can use and customize such as sliders, galleries, tabs, buttons, tables, carousels and more! It even comes with a fully functional contact form and integrated Google Maps. We strongly recommend Electoral for your NGO’s website! If you have a good environmental project or a green product business and you’re searching for the perfect HTML template that will help you achieve a strong online presence, then we recommend you take a look at Green Wave. This awesome template was created using the latest Bootstrap framework and it has a fully responsive and eye-catching design. Green Wave comes with cross-browser optimization and you can use lots of elements, features and free Google fonts in order to customize it! We strongly believe that Greenture is a great choice for your next non-profit or charity website! This simple but effective template is very well designed and optimized and it comes with countless customization options that will make your life easier. Greenture also comes with cool Parallax effects, a fully working Contact Form, Google Fonts and many other features and elements! Looking for one of the best and most popular non-profit HTML templates on the market? Lifeline 2 is your answer! This template was designed after lots of research and it comes with a fully responsive and mobile-friendly design that will look flawless on numerous devices and screen sizes. It even comes with separate pages with specific purposes such as events, team, blog, portfolio and even cause management. You can use Lifeline 2 to create stunning non-profit websites without any previous coding knowledge! Another eye-catching example of a modern website template created with charity events, donations and non-profits in mind is Virtue. This powerful template was built on Bootstrap v.3.0 and it comes with very simple and well-organized HTML code. Virtue lets you choose from 2 unique homepage designs and other 24 page templates that you can use as you please to showcase your most important information on the website! The best part about this template is that it’s incredibly easy to customize! If you’re looking for a fully responsive HTML5 template that’s both gorgeous and easy to use, then we suggest you try Ecoist. This is the perfect choice if you’re planning to create a stunning online platform for your environment care services or other eco-friendly organizations and ideas. Ecoist comes with countless features such as project templates, 2 unique Contact Us templates, 2 Team templates and more! 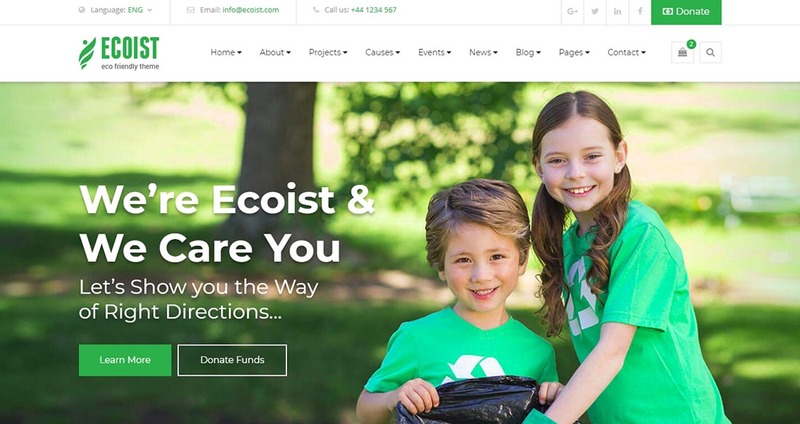 Last but not least, Ecoist is built based on the amazing Twitter Bootstrap 3.0.2.
ecoCharity is one of the greatest choices on the market for a fully responsive and eye-catching non-profit or charity website. This will work perfectly for countless NGOs, charity events and any other kind of fundraising actions. One of the best things about this template is that it comes with lots of cool features that are very versatile and easy to use! Because it was built on the awesome Bootstrap 3 framework, eco Charity is completely responsive on all devices and screen sizes! 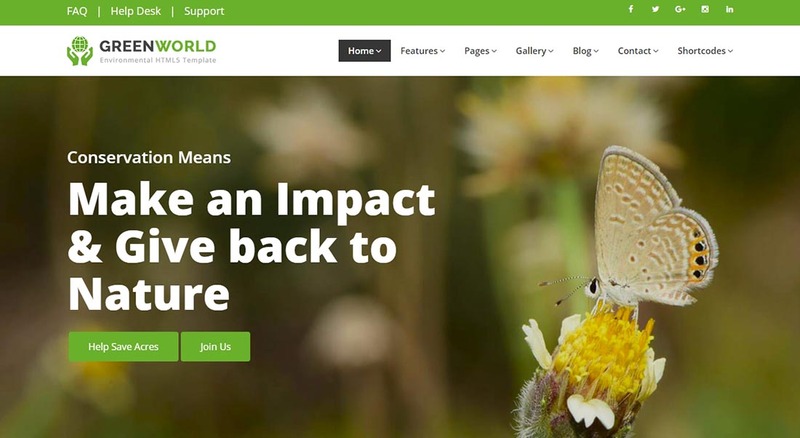 GreenWorld is a very flexible and awesome-looking Bootstrap template that was built specifically for environmental projects and other good causes. Green World is very fun to install and customize because it comes with so many options and elements that it will be impossible not to achieve the perfect result for you and your projects! Next on our list is Charry, a very powerful and easy to use website template that we recommend for any kind of charity or non-profit website! Charry was built using well-organized HTML5 & CSS3 code and it comes with a great design and unlimited color options that you can choose from! You can even choose from a boxed or wide layout, 3 homepage designs, 2 awesome portfolio pages and more! Charry was built on top of the awesome Bootstrap framework so it has a fully responsive layout! 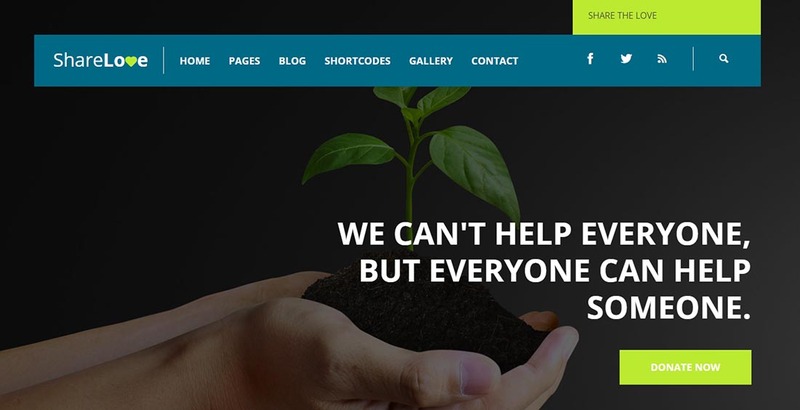 If you’re aiming to find a very modern and eye-catching HTML theme that will satisfy all your needs, then we suggest you take a look at ShareLove. This is a great choice if you want to create a great website for a non-profit organization and even rescue company! This cool template comes with lots of already-designed pages that you can use, such as Causes, Services, Clients, Contact, Events, Testimonials, Main Page and many more! If you have an environmental project or a green business and you want to create an amazing website for them, then we think Podgorica is the perfect choice for you! This awesome HTML template is very well designed and it comes packed with countless professional features that will help you achieve your goals. Podgorica comes with amazing Parallax effects, a very useful countdown and lots of other effects and options! EcoFund is another one of our suggestions for a very clean and friendly non-profit or even environmental website! Because it has such a flexible and amazing design, this theme can be used for countless purposes and causes! Because it has a fully responsive layout based on Bootstrap 3, you can rest assured that this template will always look and work perfectly regardless of the device or screen size! Here we have Ecogreen Template, another stunning HTML template that will help you create amazing non-profit and charity websites very fast and easy! This template will look great on any mobile device too because it has a very flexible and fully responsive layout! Ecogreen is very well designed and easy to use. It also comes with countless elements and options that you can use in order to create an unforgettable experience for your visitors! Looking for a fully responsive HTML template that can be used even by people with no previous coding knowledge? GreenShine is a perfect solution! This cool template comes with a very necessary ‘Donate’ button that’s already implemented and ready to use. This template has a very flexible design which makes it highly adaptable to various causes and projects! GreenShine was built on Twitter Bootstrap 3.X and it even comes with cool CSS3 animations! If you still haven’t found the perfect website template for your NGO or charity event, then you can take a peek at Charity Faith. This is a great template that’s both powerful and super easy to use! Because it’s so well designed, this template has a fully responsive design that will look great on any device you can think of. We strongly recommend this one for any kind of non-profit project, free education and even crowdfunding ideas! Charity Faith comes with more than 350 HTML files and lots of options you can choose from! Next on our list is Green Magic, one of the best non-profit HTML templates on the market! This template has a very flexible and eye-catching design and it even comes with lots of customization options. We’re sure that you’ll have fun creating your website with Green Magic! It even comes with a great donation countdown and even a Parallax effect! BeingHuman is another powerful and professional NGO and non-profit website template! We strongly recommend it to anyone that wants to create an online platform where they can raise money for certain causes in a very easy and effective way. This HTML template can be easily installed and used even by people who don’t have any previous coding knowledge! It even comes with an awesome image slider! 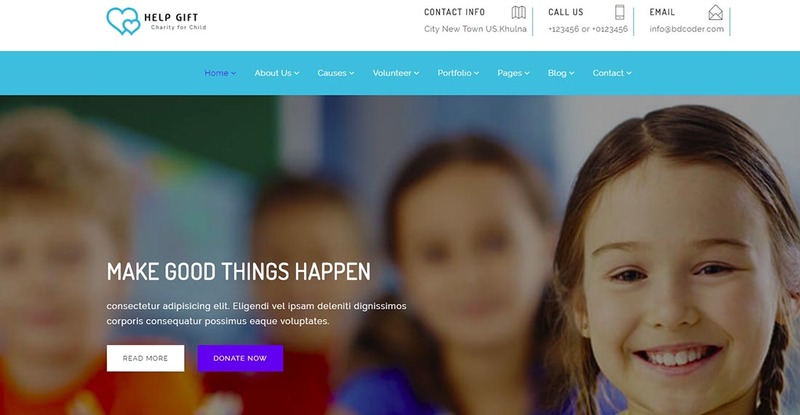 If you’re looking for a very complex and flexible HTML template that was created with charity events, churches, non-profits and even religious websites in mind, then HelpGift is the right choice for you. This template comes with a very simple but effective layout and lots of customization options. You can choose from countless free Google Fonts, icons and other elements in order to customize your website as you please. HelpGift even comes with a fully responsive Contact Form! Divinity is not only a church HTML template, but it can also work great for non-profit or charity websites! This premium template was created using Bootstrap 4 and it comes with great options such as 25 eye-catching header type designs, 28 already-created pages and more! 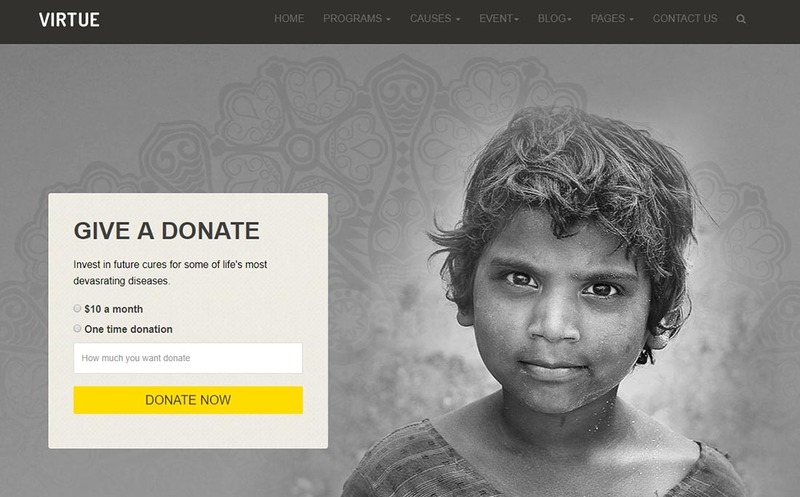 This is a great way of creating a website where you can collect funds for good causes! Last but not least, we suggest you also take a closer look at Green Soul. This template is one of the greatest choices for any environmental, biological and even ecology websites. Green Soul was created using well-organized HTML5 & CSS3 code using Bootstrap and Sass and it comes with tons of customization options that will make your life easier!